There is something of a ‘new pessimism’ emerging in bond markets, which creates significant headwinds for equity markets, writes GSFM’s Stephen Miller. I’m a bond guy, and as a paid-up member of the bond managers union (BMU), I must acknowledge that bond managers have a reputation for pessimism. Some of our more cynical colleagues in the equity market accuse us of a certain self-interested pessimism – you know, we talk our book by crying ‘recession’ or ‘crash’ at every turn, so as to hold out the prospect of falls in bond yields and ongoing strong returns from ‘safe’ bond investments. You’d think they’d be a little more grateful, given the number of times we’ve had to rescue them in the last three or four decades. No, our equity colleagues have the champagne on ice waiting for the S&P500 to hit a new record. Well, perhaps bond managers are just extraordinarily prescient as evidenced by the 30-odd years of the bond bull-market from 1981, as episodes of global recession, moderate disinflationary growth, the tech wreck and the GFC combined to send yields inexorably lower. Certainly, as a paid-up member of the BMU, the notion of bond manager prescience is not something I’m prepared to dismiss. The alternative explanation, of course, is that we are just extraordinarily persuasive. In any case the ‘new pessimism’ embraces a world of rising bond yields, creating significant equity market headwinds. At its extreme, this morphs into a view that the negative bond/equity return correlation that has characterised the period since the tech wreck, or the onset of the ‘Greenspan put’, reverts to the positive correlation that characterised the last 35 years of the twentieth century (see chart one). 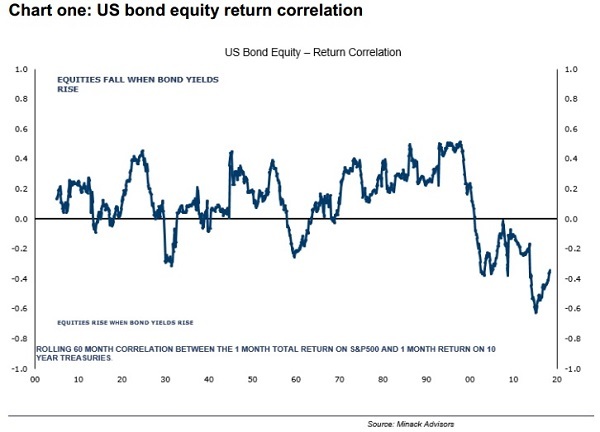 But in order to retain our pessimistic hue, the new generation at the BMU suggests that this positive correlation comes about in the worst possible way; both bond and equity markets deliver negative returns. Come to think of it, perhaps Jamie Dimon could deliver the keynote address at the Congress. Well for one thing, the US economy has a strong and ongoing growth momentum that has the potential to ‘poke the inflation beast’. 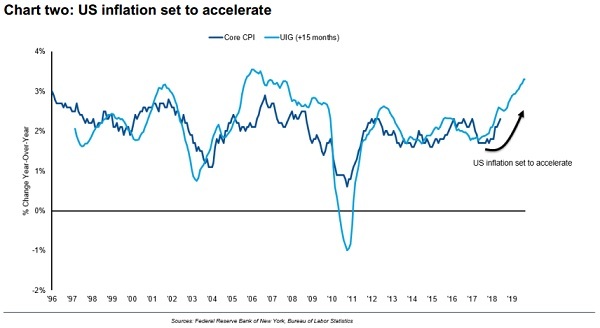 Indeed, the New York Fed’s ‘Underlying Inflation Gauge’ (UIG) – a leading indicator of core inflation – is currently at 3.3 per cent, its highest reading since 2005, and remains on an upward trajectory. Second, the Fed has more ‘shots in the locker’. The Fed ‘dots’ anticipate a Fed Funds rate of 2.4 per cent by end-18; 3.1 per cent by end-19; and 3.4 per cent by end-20. The Fed Funds Rate is currently in a target range of 1.75 per cent to 2.00 per cent. Third, the Fed is forecast to reduce its balance sheet (holdings of Treasuries and Mortgage-backed Securities) from US$4 trillion to US$2 trillion by February 2021. In other words, one of the biggest buyers of bonds in recent years is absent from the market. Fourth, despite being at full capacity, the US is forecast to run a budget deficit of close to 5 per cent of GDP in 2019. Not only does this add to inflation, but, to fund the deficit, the US Treasury also has to issue more bonds. Incidentally, and a little ironically given the protectionist crusade conducted by the US administration, the excess demand created by that fiscal stimulus will inevitably spill over into more imports. Of course, there is a rear-guard group of reactionaries who want the BMU to cling to the ‘old pessimism’. There are increasing signs, they say, of a good old-fashioned recession in the offing. They point to the fallout on global growth from the increasingly internecine trade disputes between the US and China (and others). This, they claim, will slow GDP growth in the world’s two biggest economies (with potentially devastating consequences for Australia). If the Fed keeps tightening, then a global recession beckons which ultimately tempers and perhaps reverses the recent rise in bond yields. The ‘Old Guard’ also falls back on the prescience of bond managers to justify its stance. They argue that the flattening of the yield-curve potentially presages a recession, and almost certainly does, should the curve between two-year and 10-year bond yields become inverted. The response from the other side is two-fold. Yes, they say, the yield curve going negative is a good indicator of a future recession, but the lags can be long and variable. For example, they point out that the curve was around about current levels in December 1994 and went negative in June 1998, but the recession didn’t arrive until March 2001. Similarly, the curve was flat by late 2005 but the recession didn’t arrive until late 2007. Secondly, and more controversially, they fall back on one of the more dangerous phrases in investing: “this time it is different”. The argument here is that term premiums have been artificially depressed by the Fed’s purchases of US Treasuries during the period of quantitative easing, when the Fed’s balance sheet increased from around US$500 billion in 2008 to around US$4 trillion in 2014 (and where it remains). Despite being controversial, this notion has some support from current Fed Chairman Jerome Powell. The other observation is that even if the ‘Old Guard’ is correct, then rather than deliver capital gains, bonds will deliver only low yields (at least compared to history). And whomever is right, our equity colleagues will have to work hard for their money as equity markets are potentially in for a torrid time. Stephen Miller is an adviser to Grant Samuel Funds Management.